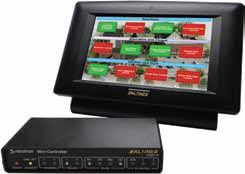 Altinex is offering two AV system control packages. Each offering provides the same functionality, with the primary difference being the port capacity of the Neutron series controllers central to each system. The Altinex Control Package #1 features a neutron controller that provides two RS-232 bi-directional ports, two IR ports, two relay ports, and two sensor ports. The Altinex Control Package #2 is intended for larger AV system designs. GlobalVue’s GVC 3200LED commercial LED television is designed specifically to meet the needs of commercial venues. GlobalVue’s LED televisions incorporate market-specific technologies, such as US B cloning and volume limiters. All GlobalVue TV sets are backed by a two-year advanced replacement warranty, making them an attractive, low-risk purchase. The series will feature a high luminance and contrast ratio, with low reflection and low color-shift image quality. Also included is 3D noise reduction. Hitachi’s CP-X3021WN and CP-X2521WN networkable mobile projectors offer versatile networking and connectivity options for business and educational applications. Both projectors incorporate Hitachi’s new intelligent eco feature, which automatically changes the brightness of the lamp according to the level of the input signal. The lamp becomes brighter when the input signal is high and dimmer when the input signal is low, reducing energy consumption and conserving lamp life. The CP-X3021WN delivers 3,200 ANSI lumens brightness while the CP-X2521WN provides 2,700 ANSI lumens. Christie’s YK 50 dual-arm projector yoke is smaller than the Christie YK 100 (single-arm yoke) and Christie YK 200 (dual-arm yoke), and is suitable for live events, theater productions, and staging applications in small- to mid-sized venues where moving video and lighting enhance the audience experience, but space is at a premium. The Christie YK 50, designed for the Christie LX700 or Christie LHD700 projectors, can be used as a moving light or moving video projector. The Christie YK 50, when combined with the Christie LX700 or Christie LHD700, provides 7,000 ANSI lumens. Roland Systems Group’s Roland V-1600HD multiformat video switcher’s new update provides additional scaling functions to both the program and aux outputs in all modes. This includes common LED video wall aspect ratio presets such as 4:3, 5:4, 5:3 and 16:9 plus a manual, pixel accurate mode where any wall size or aspect ratio can be dialed in. From that setting you can then scale the source material within the output space with crop, zoom, and position adjustments. Covid is now distributing the Rainbow Fish fiber optic HDMI cables that allow for HDMI transmission over fiber optics. When using the Rainbow Fish cables, users can connect up to 1,000-foot lengths with no signal degradation. These fiber HDMI cables are in-wall/riser rated. The cable is equipped with a US B power cable integrated into the receiving HDMI connector. The housing is constructed of high durability composite material for necessary protection of the internal HDMI to fiber transfer. In order to expand the offering within the E-Series, d&b is launching the new E4 and E5 loudspeakers that are lightweight, two-way passive loudspeakers that employ a four-inch and five-inch LF driver respectively and a coaxially mounted wide dispersion dome tweeter. Both are mounted in highly compact enclosures and offer wide symmetrical dispersion patterns in the horizontal and vertical plane, while the cabinets may be mounted in either attitude. Auralex Acoustics’ ProMAX panels are designed as a portable, lightweight, yet highly effective absorption treatment for run-and-gun recording situations, such as studio rentals, live events, temporary recording applications and any location where mounting acoustical treatments to the wall are not possible or ideal. The flexible absorption panels are simple to set up and transport and easily assembled and disassembled for convenient storage. Their lightweight and flexible design makes them ideal portable absorbers as they can be moved easily and positioned to reduce audible reflections in any recording or listening environment. ViewSonic’s PJD6 Series DLP projectors are Crestron and AMX certified, and all specifically designed for both classroom and corporate environments. ViewSonics PJD6 Series projectors are equipped with Crestron RoomView network management software that enables centralized control for up to 250 projectors. PJD6 Series users can always present their content with the appropriate lighting to capture audience focus by dimming an image as needed while enjoying an automatic energy savings of up to 70 percent. Furthermore, the PJD6 Series ECO mode delivers a longer lamp life of up to 6,000 hours for greater energy and cost savings, along with the added bonus of noise reduction. Bracketrons iRoom iDock Touchcode is a powered, motorized, in-wall iPad mounting solution. Available in portrait and landscape models, the iPad dock can be flush-mounted in the wall, and the new Touchcode model ensures that an iPad is safely stored in the docking station and only releases the tablet upon entering a programmable fourdigit code. The iDock includes both power and composite audio internal connections and features a patented motorized docking system that opens and closes to securely store the iPad. The opening mechanism is activated by a one-touch proximity sensor that recognizes when users are nearby and switches the iDock to the open position for inserting an iPad. The proximity sensor can also be disabled to lock the iPad permanently in place. Outline’s GTO-DF is designed to provide high-quality sound to the first several rows of the audience at an event, filling the sonic gap often experienced by event attendees that are seated near the stage. The GTO-DF, with its purpose built, new horn design and acoustic lens, delivers accurate performance within the form factor of a GTO array. The GTO-DF offers four eight-inch mid-woofers and two three-inch compression drivers. Camco’s D-Power D7, D1, and D05 covers a power output range from 250w per channel at four ohm to 2,300w per channel at four ohm. Featuring Camco SMPS technology, comprehensive protection circuitry and limiters, and Camco sonic performance, the D-Power series achieves exceptional price to watt ratio throughout the series. A closer study of the full output power specifications indicates the range delivers vast flexibility in either stereo or applicable mono bridge applications. Pelican Products’ i1075 HardBack case was developed in a unique partnership between Pelican and BMW Designworks (a division of BMW). Fitting in most soft bags, the case features a special molded foam system designed to protect and secure the iPad or iPad 2, along with an Apple Bluetooth wireless keyboard, a power adapter, ear buds and download cables. The foam system also acts as an easel for the device in either horizontal or vertical positions so the user can work straight out of the case. PWS’ Domed Helical Antenna incorporates the circular polarization configuration pioneered by the original Helical, but seals the unit within a unique new compact Domed design. Constructed from rugged Polycarbonate, PWS Domed Helical’s are designed to hold up to considerable road-related abuse. The product was developed to provide robust, multi-channel wireless microphone, and in-ear and intercom wireless connectivity. RTW ’s TM3 includes features of the larger TM7 and TM9 versions and is controlled using a touch-sensitive display. With its budgetfriendly base price of less than $1,400 U.S. (basic stereo version), 4.3-inch touchscreen and stylish exterior, allowing for horizontal and vertical placement, the TM3 is an alternative for editorial offices, edit suites, and small control rooms. Featuring PPM and true-peak instruments, the TM3 offers comprehensive loudness metering in compliance with all globally relevant standards. Instruments include single-channel and summing bar graphs, an LRA instrument and numerical displays. The basic version handles analog and digital stereo audio, while the 5.1 option adds the support of six-channel digital input. IBASE Technology’s SI-08 is a fanless system designed for digital signage. The SI-08 is powered by an efficient yet low-power AMD G-Series APU with an on-die discrete-class DirectX 11-capable GPU. Combining a dual-core x86 processor with an 80-core graphics engine, the SI-08 is capable of supporting resolutions up to 1,920 x 1,200 along with DirectX 11 and OpenGL 4.0 APIs. It is also capable of hardware decoding video formats such as H.264 AVC , VC -1 (WMV9), MPEG-4, and MPEG-2. Symetrix’s Solus 16 is SymNet DSP hardware appropriate for small to mid-sized installations not requiring I/O expansion. System designers have the option to use or modify Solus DSP design templates for basic projects, or to create unique designs entirely from scratch. The three Solus hardware offerings differ only in their audio input and output counts: Solus 16 with sixteen inputs and eight outputs, Solus 8 with eight mic/line inputs and eight outputs, and Solus 4 with four inputs and four outputs. Ethernet, ARC port, RS-232 port, two control inputs, and four logic outputs complete the control feature set. MilesTek has added an HDMI over single RG6 Coax to its product line that extends HDMI sources up to 400 feet and cascades even further to multiple displays. The HDMI over single RG6 Coax transforms analog to digital over coax and extends and splits two HDMI sources to multiple displays. The Extron DTP HDMI 301 and the DTP DVI 301 are long distance twisted pair extenders. The extenders transmit digital video, embedded audio, and bidirectional RS-232 and IR control signals over a single Cat-5 cable. The transmitter and receiver sets are capable of extending 1080p/60 deep color and 1,920x1,200 up to 330 feet (100 meters). These features combined with remote powering capabilities and compact enclosure sizes, make the DTP HDMI 301 and DTP DVI 301 appropriate for extending digital video, multi-channel audio, and bidirectional control signals in space-challenged environments. NEC Display Solutions’ 27-inch MultiSync EA273WM features a completely redesigned chassis, which is up to 30 percent thinner and 25 percent lighter, along with a 130 mm height-adjustable stand and future-proof connectivity, such as DisplayPort and HDMI inputs. BenQ’s Joybee GP2 projector features the same elegant black and white housing while adding a number of enhancements, including an intuitive user interface, 720p HD-ready video capability, short-throw projection, an integrated iPhone/iPod dock, an optional three-hour battery pack, and various connectivity options. Based on high-efficiency 3LED illumination and DLP projection technology, the light and compact 565-gram, palm-sized BenQ Joybee GP2 offers AV multimedia on the go. Gepco International’s CTS 2504HDX two-channel snake consists of two elements of Gepcos CT 504HDX heavyduty tactical Cat-5e cable under an overall rugged TPE jacket. While the inner jacket maintains the proper physical spacing between pairs to achieve ISO /IEC or TI A/EI A Cat-5e specifications, the durable TPE outer jacket protects the cable from physical damage or abuse. JVC Professional’s VR-X1600U and VR-X3200U video recorders offer 16 and 32-channel recording, respectively, as well as support for 720p and 1080p full HD resolutions with multi-codec support. Equipped with built-in camera licenses with no recurring fees, as well as the latest versions of Milestone XProtect Enterprise and Windows embedded OS , the VR-X NVRs offer enterpriselevel, full HD recording and viewing for an unlimited number of NVRs, cameras, sites, and users. Tripp Lite’s U026-20M active extension cable uses a built-in signal booster to overcome the 16-foot US B 2.0 signal distance limitation. Two of these cables can be daisy-chained together to increase the overall distance to 131 feet. This configuration supports data transfer rates of up to 480 Mbps. Kramer Electronics’ VM-114H4C, is the first digital switcher/ distribution amplifier in a family of new digital switchers featuring varying output combinations. The VM-114H4C accepts two input signals, one HDMI, and one DGKat (HDMI over twisted pair), and switches between these two inputs while outputting the signal selected over four identical DGK at outputs. The VM-114H4C features Kramer’s I-EDIDPro intelligent EDID processing, an EDID handling and processing algorithm that ensures plug and play operation for HDMI systems. Matrox’s MC-100 is a dual SDI-to-HDMI mini converter that supports a range of display resolutions through 3G, dual link, HD, and SD-SDI. This single portable unit can be used as an HD-SDI switcher, a distribution amplifier, a multiplexer, and a 3D processing unit. Key features of Matrox MC-100 include: multiformat SDI signal distribution; SDI signal amplification 300 meters in SD, 100 meters in HD, 70 meters in 3G; switching between two HD-SDI feeds; Loss-of-signal switching in case of invalid or lost input signal; Multiplexing of two HD-SDI video signals into a single 3G-SDI feed; Realtime 3D processing including Horizontal Image Translation (HIT ) and vertical offset adjustments. Hosa Technology’s Mogan Microphones is a new brand of subminiature microphones, the first offering of which is the Mogan Standard Omni Earset Microphone. Offering solid performance and unbeatable value, the new Mogan Standard earset microphone is designed to deliver high-quality audio at a price that will appeal to budgetconscious presenters. The new Mogan Standard earset microphone features a 3.0 mm omni-directional capsule with -45 dB nominal sensitivity that is designed to be positioned near the corner of ones mouth. Crimson’s VersaFit in-wall mounting systems solve complex display mounting challenges and create innovative options for systems integrators worldwide. Designed to blend flawlessly with existing decor, hiding cables and associated hardware, VersaFit consists of a recessed in-wall box that mounts securely between studs behind almost any wall-mounted display. A compatible Crimson mount installed into the VersaFit backbox completes the system without disrupting other design or installation elements. Telecast Fiber Systems’ Thor- CBL-HDMI is a hybrid cable solution using multimode fibers for RGB and high-speed digital graphic signals, and copper wires for low-frequency HDCP control signals. The Thor-CBL-DP provides an alternative to digital display interfaces such as HDMI and DVI . Both systems harness optical technology for transmissions that stretch performance beyond the limitations of copper wire by spanning greater distances and eliminating costly analog distribution systems. RGB Spectrum’s DSx H.264 graphics and video server line is a fully integrated system for centralized recording, storage, management, and distribution of H.264 graphics and video. It is part of RGB Spectrum’s line of H.264 codecs supporting graphics and HD/SD video at resolutions up to 1,920x1,200. The SD10-24 measures just under a meter in width, with a work surface constructed from anodized aluminum overlaid with polycarbonate panels to provide clear and concise user feedback. The control surface features 25 100mm touch sensitive faders, providing fast access to the console’s large number of channels, which include 96 with full processing and outputs that can be assigned across the surface. All inputs have dual mono inputs for fast main and alt channel switching. Smart key macros are provided and accessed via four layers of ten backlit LCD keys.